There are two Henry Grubbs in my family tree: Henry Grubb the elder, my great (x5) grandfather (c1762-1845) and his son (c1786-1863). As they both lived out their lives in Lewisham, until Henry senior’s death it is difficult to tell which is which in the various references. In 1814 and 1815 several adverts for auctions of land in Lewisham and Sydenham appeared in both the Times and the Morning Post. Henry Grubb of Lewisham appears to be acting as a local agent from whom details may be obtained; he was apparently well enough known to need no other address. In 1829 and 1835 Henry Grubb is listed as a Greengrocer in the records of the Sun Fire Office. 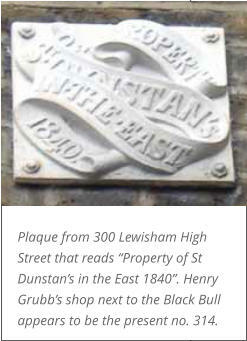 His property “near the vicarage” in High Road, Lewisham - along with his neighbours’ properties - was leased from “The Churchwardens and Trustees for the time being of St Dunstans in the East”. The records of Saint Dunstan's College in Catford contain details of these leases and the correspondence relating to them. Meanwhile Pigot's Kent directories for 1832-34 have a Henry Grubb as licensee at the Castle, Lewisham. But is this Henry Grubb senior or junior or another Henry Grubb altogether? Though John Divall, Henry senior’s son-in-law was listed as a Victualler at the Castle in 1815 at the baptism of his son John, and just as an innkeeper or victualler in other records till 1820. Both Henry Grubbs appear on the 1841 census as Greengrocers, aged respectively 75 and 50, and living next door, on the north side, to the Black Bull in Lewisham High Street. Living with them are Henry senior’s grandchildren, the orphaned children of his daughter Mary Ann and John Divall: John (25), Maria (20) and Susannah (18, and my great (x3) grandmother). Henry Grubb the elder died on the 29th July 1845, in his 82nd year according to the memorial inscription in Lewisham churchyard. His will was proved over two years later on the 18th October 1847. He leaves his “two freehold messuages or tenements with the land or ground and hereditaments and the right of way and other appurtenances to the same belonging situate and being in George Place in the parish of Lewisham” and his “leasehold messuage or tenement ground and premises with the appurtenances next and adjoining to the Bull Inn in Lewisham aforesaid and now in my own occupation and all my estate and interest therein” along with the rest of his personal property to his son Henry, who is also his executor. 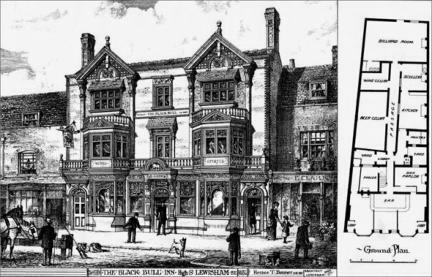 The Black Bull (now The Fox & Firkin) in 1885. The Grubb’s shop next door seems to be run by an E. Clark. Henry the younger in the 1851 census is still running the greengrocers in Lewisham High Road next to the Black Bull Inn; he is 61, unmarried and “quite deaf” and about to run into trouble from one of his neighbours. As the Morning Chronicle reported on Saturday, October 13, 1855 under the headline: GREENWICH YESTERDAY. ANNOYANCE. Joseph Turpin appeared in answer to a summons, charging him with annoying Henry Grubb, under the following circumstances: - From the statement of complainant (who is of very eccentric habits, and a reputed miser and half-witted), it appeared that he had been subject to annoyance for the past four years, two and a-half of which he has been constantly watching for his (complainant's) persecutors, and the last four months of which time he has not been in bed. In the present case, the defendant, during his temporary absence from his house, placed a lot of stones and rubbish at his door, and filled his key-hole with gravel, so that he could not for some time get in. He was subject frequently to such annoyances, and had before applied to the magistrate and police for protection. The case against the defendant having been proved by a gentleman who was passing. The magistrate, after censuring the conduct of the defendant for jesting with the infirmities of the complainant, sentenced him to find two sureties, in £10 each, to be of good behaviour for six calendar months. When I first read this I assumed Joseph Turpin was a delinquent youth. But far from it, in the 1851 census he is a 56 year old Cooper living just a couple of doors away. He was a long time neighbour of the Grubbs being listed with them in the Sun Fire Office Records of 1829 and 1835. Isabella, Joseph’s wife, registered John Divall junior’s death in 1841. Henry doesn’t seem to get much sympathy in this report: a lot of his eccentricity and apparent half-wittedness can probably be put down to his deafness. However his reputation, most likely as a result of this story, spread, and was enlarged upon and his age increased by a decade in L. Duncan Leland’s "History of the Borough of Lewisham", published in 1908, where he has become a stereotypical miser. "A word must be added here respecting Henry Grubb, one of the eccentric characters of the 'old Lewisham', who lived in the house on the northern side of the Black Bull and died in 1863 at the age of 87. He lived alone allowing no one to enter his house, and by his miserly habits had amassed considerable wealth. For 17 years prior to his death he was in a habit of sleeping in a chair with a loaded blunderbuss in his arms, to protect the treasure concealed about the house, whilst cobwebs filled the rooms, many of which had not been opened for 30 or 40 years." In 1861 Henry Grubb is still living in the same place; aged 76 he has been promoted to the status of Gentleman, and is “46 years deaf”. Joseph Turpin, now aged 66, is still living two doors away. Henry died on the 30th of September 1863 and was buried on the 6th October in St. Mary’s, Lewisham, aged 77 years. He died intestate leaving effects “under £5000”, so perhaps the comments about being half-witted and a miser were partly true! However the details from the National Probate Calendar do finally confirm the family relationships, though it would be good to know where his assets ended up: GRUBB, Henry. Effects under £5,000. 6 January . Letters of administration of the Personal estate and effects of Henry Grubb late of Lewisham in the County of Kent Yeoman a Bachelor deceased who died 30 September 1863 at Lewisham aforesaid were granted at the Principal Registry to Fanny Ingersoll (Wife of Kemsey Ingersoll, Smith and Farrier) of Lewisham aforesaid and Susannah Rosina Cater (Wife of William Charles Cater, Labourer) of Lewisham aforesaid the Nieces and only Next of Kin of the said deceased they having been first sworn. For more on Fanny and Susannah please visit the Divall page. Presumably his freeholds in George Place were sold, and Lewisham Archives hold papers concerning his leasehold estate in Lewisham High Street and Hither Green as part of the records of Saint Dunstan's College, Catford. Were Grubb’s Cottages in Hither Green anything to do with the family? It can be seen from the 1841 census that they were the next stop on the enumerator’s round after The Spotted Cow now at 104 Hither Green Lane before he headed on through George Place. There are various unnamed and scattered buildings in this area still shown on the 1864 Stanford map of London available on the Mapco website. It was long remembered in the family that we had once owned land in Lewisham and lost it somehow. My mother recalled: “An incident that amuses me even now when I think of it, happened when I was very small, about 5 or 6, I would think (1921/22). We were visiting relations, one of Dad's stepsisters in the Lewisham/Catford area. The grown-ups were all talking family matters when I heard them saying that the Wreck of Lewisham belonged to our family and that we would go to see it. I had visions of a big boat - wrecked of course. But when we got to the river it was so tiny (called the river Quaggie I believe) I wondered where it could be. Well I remember being very disappointed at there being no wreck. Ages afterwards of course I realized it was Lewisham Recreation Ground the grown-ups had been talking about. That being in the family didn't impress me one bit. How we lost it I do not know - but we did.” Perhaps the location - and the name of the river - has been mis-remembered, but it is another family story that has turned out to be basically true. There are some tantalising references to earlier Grubbs in Lewisham in the Admission & Discharge Registers of St Thomas’s Hospital. A William Grubb of the Black Bull in Lewisham is named as a patient's financial guarantor on several occasions in 1787 and 1788. Was this on his own account, perhaps as employer, or was it on behalf of the parish - at least one of the entries has the letters PP attached which indicates that the patient was sponsored by their parish. There is also a Henry Grubb of Lewisham, shoemaker, named as guarantor in 1800. A Peter Grubb, born in Lewisham attested to serve in the Royal Marines 113th Company at Portsmouth in 1800 (when aged 22). Henry Grubb the elder’s will This is the last will of me Henry Grubb of Lewisham in the County of Kent Yeoman I give devise and bequeath unto my son Henry Grubb the younger all those my two freehold messuages or tenements with the land or ground and hereditaments and the right of way and other appurtenances to the same belonging situate and being in George Place in the parish of Lewisham aforesaid and also all that my leasehold messuage or tenement ground and premises with the appurtenances next and adjoining to the Bull Inn in Lewisham aforesaid and now in my own occupation and all my estate [term?] and interest therein. And also all my ready monies and all other the residue and remainder of my estate property and effects whatsoever and wheresoever and which I shall or may be possessed of interested in or entitled to at the time of my decease in any manner or wise howsoever. To hold the ... and the whole and every part thereof respectively (but subject as to the said leasehold premises to the rent and covenants affecting the same) unto my said son Henry Grubb (the younger) his heirs executors administrators and assigns according to the nature and tenure thereof respectively. And I do hereby nominate and appoint my said son Henry Grubb (the younger) sole executor of this my will. And lastly I do hereby revoke and make void all former and other will, codicils and testamentary dispositions by me heretofore made. In witness whereof I the said Hery Grubb the testator have to this my last will at the end thereof set my hand this eighteenth day of October one thousand eight hundred and forty one. Henry Grubb [signed]. Signed by the said Henry Grubb the testator as and for his last will in the presence of us present at the same time who in his presence at his request and in the presence of each other have hereunto subscribed our names as witnesses thereto. Jn: Fred: Parker Solr. Lewisham -- Francis Barber his Clerk... Proved at London the 18th October 1847 before the Worshipful Sherrard Beaumont Burnaby Doctor of Laws and Surrogate by the oath of Henry Grubb the son the sole executor to whom administration was granted having been first sworn duly to administer.